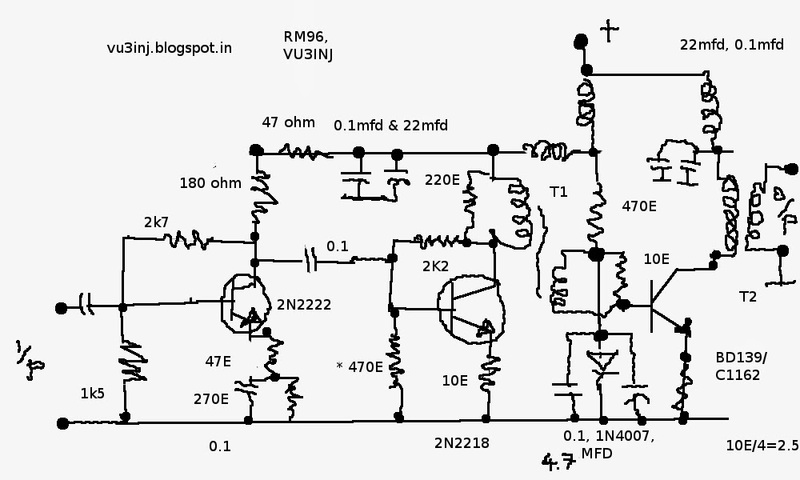 The RM96 transmitter is a very successful and re-produceable design. I have used it's different block in various projects. But, never made the tx chain. got the toroids from vu2ptr and started brewing only tx linear part. it is not advisable to make rf ckt on general purpose veroboard. It is good to use the glass epoxy based etched pcb. Manhattan style on copper plane is also a good options. but i dont have those things at my disposals. A little description of the components shown on board:-(fig.1) 2n2222 a small transistor, then 2n2218 with crown heat sink and lastly bd139 with a bigger aluminium heat sink (found from junk, used parts). will feed it with dsb modulator freq 7058kc, see earlier posts on this blogs for this dsb modulators. 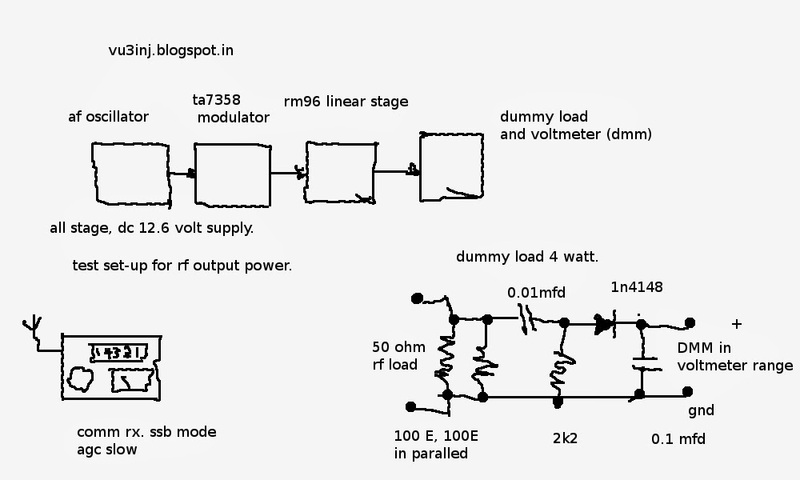 Then probably this will drive a single ended linear based on irf830 or any other push pull amp. Finished the soldering today morning. (25feb) Done little touch-up, visual inspections and then it is time to hot test. For this test, i did drive this amplifiier with one spare 20 meter (TA7358ap with xtal) based modulator. Linear ckt was powered with 12v. 1 Amp dc supply. 4 watt dummy load also connected as output rf load. When the power transistors are touched by finger, it indicates the hot/cool property of temperature. I touched 2n2218 it was hot faithfully. Then, i become happy and touched the BD139. It was as cool as 2n2222. Hmmm,,,,,That means not working/drawing up the dc current. Something fishy. Visual inspection done. Needs to look for dry connections. Bd139 base shows 0.67 voltds dc. Ok. but collector shows the dc voltage variations 6 to 7 volts. Dry connections and as a rough rf test when touched 2218 it shows increase in the strength of signal in com rx, but when bd139 is touched it does not show any increase that means it is not producing the rf and not radiating to near by com rx. On voltage test found that when 12v, 1 amp capable power supply was used line voltage dropped to the 11volts. When current increase beyound normal capacity of transformer line voltages becomes low. OK. There was no smoke. Now, it is time to use the real 12v,5amp power supply and it remained at the 12 volt dc..The RF amplifier takes 220 ma constant dc. if bd139 was conducting it should be drawing up more current. say if we consider 50% efficiency then it would require for 550 ma to 1 amp current and peak will be more to produce the 3 to 5 watt rf. So, work in progress. I had a made two module using the xtal 14318kc dsb once was used in earlier project and this was a spare one. So, far so good. once it is working. it should produce minimum 1watt rf. with it will drive a linear. I will air test these setup only after more then 10w to 22w external linear is successfully made. I dont want people to look after when it was even not radiating in the locality. 26feb2014:- somehow BD139 was showing some problems, not heating up or producing any rf so removed it. i noticed one thing during experiments, when the 2N2218 stage heats up signal strength meter in the receiver signal stregth goes high up, from 0 to 3. It means, due to heat-up current is increased and so does the rf. a perfect case of thermal run-away. 12.6 volts, 150ma current. also toroid gets heated up as it is not driving anything. Interesting. 26feb2014:-evening. I removed the 470ohm and 1n4007 diode network for bias and instead installed a 10k pot. it increased the current and at the 330ma,12vdc it gave me optimum result. please dont forget to put the 10ohm in emiter leg. Also changed the bd139 with c1162 and it made a good change. Rf has increased but not heating up the 4watt resistors. Only heating up the heatsinks, he he. 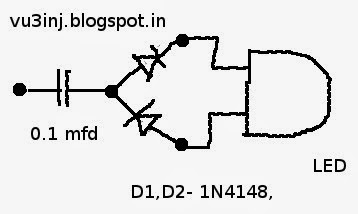 Its time to reduce the dc current of 2n2218 stage from 130 ma to about 100ma. and also try to use irf510 instead of c1162 and see whether it produces some usefull RF at 12 voltage or not ! in the emiter leg of bd139/c1162 according to the hmy2k8 ckt there is 10 ohms but vu3prx it is 6 ohm and rm96 it is 1 ohm. ohh thats seems to be my culprit. let me see you. From a dsb modulator (ta7358 with xtal ) signal is given to the 2n2222 stage and output is taken from the last transformer T2 on 50 ohm load. RF voltage measured and signal heard on com. rx. 14331kc. this feb is only 28 days. I did rewind the transformer of last bd139 stage, did put the 10 ohm resistor on its base. also put the 1k resistor across 470 ohm in the base of 2n2218. it reduces the current to 80 ma around and there was less heat. but over all power coming out from the c1162 halved that means it is just putting power in the miliwatts. not even a single full watt. wow ! when the ready made pcb is used those designer / elmers have solved the bugs and made it workable. pity is , somehow we dont got the transfer of tech due to the limitation of the bandwidth or space on the magazine or suveniours etc. I hope new homebrewers get the benefit of their techniques from my quest. so i will put one more stage but i am doubting and want to know first what went wrong. if it does not give me 1 watt how i am going to drive it to other stages ? now i will make one more stage irf510 or 2C2068.... i dont know. with swamping resistors rf power is reduced but quality improved and self oscillations reduced. it becomes broad band. I changed the bias of last stage instead of 470 ohm, 1n4007 network a 10k preset was used. 10 ohm resistor on base of bd139 stage is not used. This gives me visual indications. just eye-candy. But, a very useful visual aid for rf strength indications, if the stage is self oscillating presence of rf also can be seen. Best test for oscillations is done on comm.rx or oscilloscope and spectrum analyzers. There should be one more stage of amplifications & filtering ahead of the 2N2222 stage. As, all these amplifiers are "class-A" stages ,more the input signal more will be output at T2 secondary. Ok, then, i can put the swamping resistors back and enjoy. Efficiency will be very low, say typical 25% for class-A. 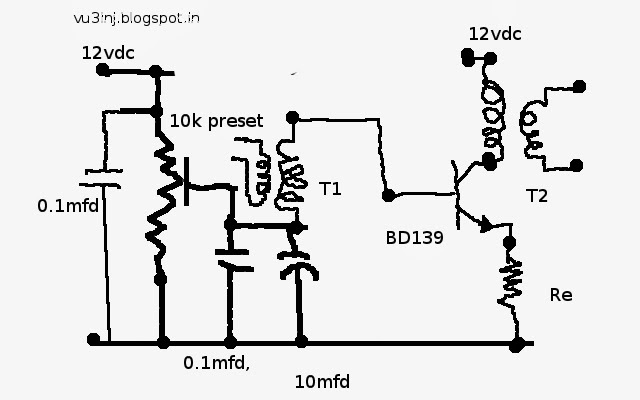 Also can try another stage of class-AB amplifier after the c1162/bd139 to reach the elusive 5 watt level. You must get the proper toroids, without them project will fail. I will put another page link (here )for showing the voltage charts , references, toroids windings , rf power meter etc. what is the equivalent amidom torroid for T-05hfa.